In the past it used to be movies that released soundtrack albums, but these days the trend has spread to hit TV series. 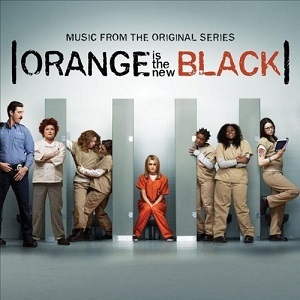 The latest such release is music from the series "Orange is the new black". As you'd expect for an album of songs from a TV series, it's a compilation with songs from a range of different artists. The range of music here is really quite surprising - you've got music from the 60s and 70s as well as more recent and current songs. As well as the music coming from different era's you've got very different styles of music - "Milkshake" by Kelis for instance is as different from "Sunday morning" by Velvet underground & Nico as its possible to get. With such a diverse mix of music included then this could end up as a horrible mess as songs that fit into different episodes well might not work so well when put side by side on a single album, but actually this album works very well. Yes there's a lot of variety but most of the tracks fit very well. One thing that appealed to me with this album is the choice of songs. With a couple of exceptions, these arent massive hit songs that everyone will know - it's almost certain that there will be songs here that are new to the listener, and as a result it's a great way to discover different artists. For me the opening track by Regina Spektor is a real highlight, alongside the well known classic, "Sunday morning" by Velvet Underground & Nico. You don't have to be a fan of the TV show to enjoy this album, but I'm sure it's going to be fans of the series who make up most buyers of the album as they'll have heard the songs int he show, and this is a chance to get some of those songs on CD. A great compilation, even without the TV tie-in.